Free postage on all gift vouchers purchased! All AUD dollar values of gift vouchers includes shipping/handling fee to dispatch items purchased to your gift recipient. The Perfect Gift, Every Time! 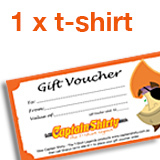 Share your love of the Muscle Car with a Captain Shirty Gift Voucher. Available in the amounts shown (including shipping/handling of t-shirts etc). 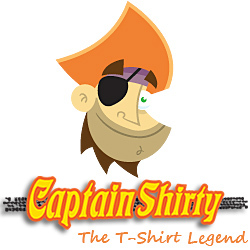 If you would like more than a 4 t-shirt voucher please contact sales@captainshirty.com.au so we can arrange the most efficient and cost effective shipping option to be included in your gift voucher for that special person in your life! Please note that the Gift Voucher will be sent in an activated state and ready to use upon receipt. All vouchers are valid for 12 months from date of purchase. Not redeemable for cash. Lost or stolen vouchers cannot be replaced.